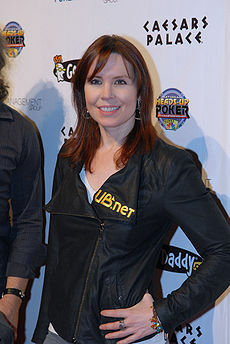 Annie Duke (born Anne LaBarr Lederer; September 13, 1965) is a professional poker player and author who won a bracelet in the 2004 World Series of Poker $2,000 Omaha Hi-Low Split-8 or Better Event and was the winner of the 2004 World Series of Poker Tournament of Champions, where she earned the Winner-Take-All prize of $2,000,000. In 2010 she won the National Heads-Up Poker Championship, earning a cash prize of $500,000 in addition to the title. Annie attended Columbia University where she double-majored in English and psychology. Subsequent to her undergraduate years, Duke was awarded an NSF Fellowship to attend graduate school at the University of Pennsylvania to study psycholinguistics, a field within cognitive psychology. Although originally intending to continue her studies, she decided to leave school in 1992, after five years of graduate school and one month before defending her Ph.D. work. She married Ben Duke, a close friend from the same university, and moved to his home in Columbus, Montana. It was at this time that, with the support of her brother, she began playing poker in nearby Billings, Montana. After leaving her academic work, Duke began playing poker in the legal card rooms in Billings, Montana. Her brother, Howard, was already a successful professional and he both coached and helped finance her poker play initially. In 1994, she and her husband moved to Las Vegas in order to play poker full time. In early 2004, Duke received considerable publicity for tutoring actor Ben Affleck, who then went on to win the 2004 California State Poker Championship. Before that time, one of her claims to poker fame was her 10th place finish in the 2000 World Series of Poker (WSOP) main event — one position short of the final table — while eight months pregnant with her third child. In the 2004 World Series of Poker, she eliminated her brother, Howard Lederer, from four separate events, including the World Series of Poker Tournament of Champions, where she took first place and her brother took third. During this same World Series, she won her first gold bracelet, in an Omaha Hi-Lo tournament. She was one of three women (Kathy Liebert and Cyndy Violette being the other two) to win an open event in that year's WSOP. In 2006, Duke won the second annual World Series of Rock Paper Scissors (WSORPS). The WSORPS is an annual charity tournament hosted by Phil Gordon at the World Series of Poker. The winner receives free entry into the WSOP Main Event and the proceeds are donated to Gordon's charity Bad Beat on Cancer. As of 2008, Annie holds the women's record for most "in the money" finishes at the WSOP. In September 2004, Duke won $2,000,000 in the inaugural World Series of Poker Tournament of Champions, a 10-player, winner-take-all invitational event. At the time, this victory was the most money paid in a single event to a female poker player. That record was broken by Annette Obrestad during the 2007 World Series of Poker Europe Main Event. Duke has won one World Series of Poker bracelet, in Omaha HiLo, and more than three million dollars in tournament play. Nowadays she refuses to play in women's only tournaments, saying that "Poker is one of the few sports where a woman can compete on a totally equal footing with a man, so I don't understand why there's a ladies only tournament." As well as competing, Duke writes and speaks on poker-related subjects, and promotes poker-related organizations. Since 2000, she has been a spokesperson for UltimateBet and has written many articles for the online poker website, mainly on Omaha HiLo. In 2005, Duke penned her autobiography, How I Raised, Folded, Bluffed, Flirted, Cursed, and Won Millions at The World Series of Poker. Annie Duke is a teacher at the WSOP Poker Academy poker school. She appeared on The Ellen Degeneres Show and donated a WSOP Academy Experience Package which was auctioned off to benefit the Humane Society. In total, Duke has won over $4,270,000 in live tournaments and is ranked as the third highest winning woman of all time, as of 2012.